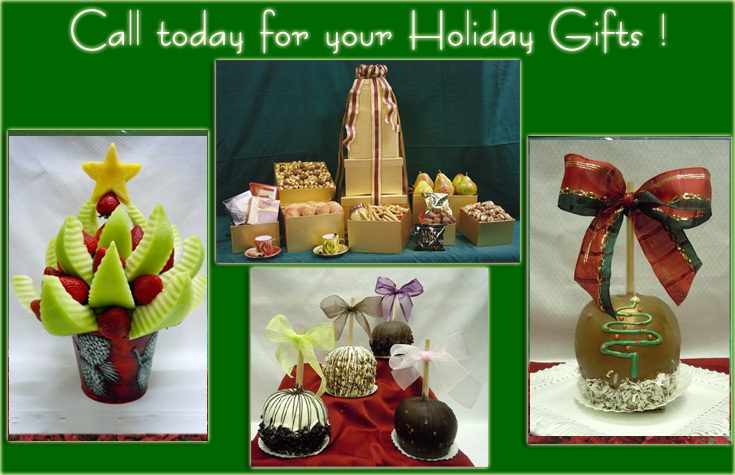 Your Local Source for World Class Fruit Baskets, Gift and Gourmet Baskets! We use only the finest ingredients for our gift towers. Each box is generously filled with everyone's favorites. Send your best wishes to all your friends and loved ones. Our mouth watering and bountiful assortment of the finest confections is sure to please anyone and everyone on your list. Make a beautiful presentation at your holiday table with our unique edible bouquet. Succulent honeydew and strawberries. Sweet and juicy pineapple. All fashioned in the shape of a Christmas tree .Perfect for your special celebration. Made with only the freshest and finest tasting fruits. Presented in our charming keepsake container. Place it on your table and listen to the compliments, or send it to someone special on your list.. Seven grand and festive gift boxes standing over 30 inches tall. Vibrant colors and delicious flavors fill this Tower with joy and memories of days gone by. The ultimate crowd pleaser. Plump and delicious Royal Riveria Comice pears. Premium melt in your mouth butter cookies. A savory assortment of the finest cheese spreads. Delicious gourmet pretzels with flavored mustard. Finest quality assorted mixed nuts. This is a gift that takes center stage for your friends and family to enjoy along with all their Holiday guests.